Dear reader, interested in an exciting triology? And it is not fiction, although it is certainly shocking. 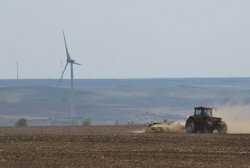 It appeared recently in international media and it goes like this: Romanian farmers discovered their land had been sold without their knowledge or consent. Investigative journalist Luke Dale Harris and Sorin Semeniuc followed the money trail all the way to Rabobank, the Dutch banking giant that turns out to have invested millions in agricultural land in the country. Think land grabbing is a thing of the past? Think again. Tales of corruption surrounding Rabobank dealings in Romania. Farmers in what may be the poorest village in Romania pressured into selling their land to Rabobank. Moral of the story: land grabbing is not only a “global south” problem, it is a European reality too. The weapons might be different but the outcomes are all too familiar for peasant farmers and small food producers. Rabobank is merely one “top player” amongst hundreds of other multinational companies, investment funds which put their bets on Eastern European farmland. According Eco Ruralis, Romanian peasant organization and Access to Land network member, the bets are off and peasant and agroecological farming desperately needs an upper hand in their struggle for land!